The recent band of violent storms that went through southern Ontario caused a lot a damage, most notably the destruction of a truly iconic silver maple tree in Toronto. It has been know as the tree that was the inspiration of the wonderful anthem, "The Maple Leaf Forever" which was written, by Alexander Muir, a local teacher, at the time of Confederation. I remember singing it often as a child along with "God Save the Queen". Our official National Anthem is "O Canada". I remember fondly the tune of "The Maple Leaf Forever" but it's lyrics are of a different time and place. It is a celebration of British Imperialism and settlement of North America. It is out of step with the bilingual./ multicultural country Canada has become. 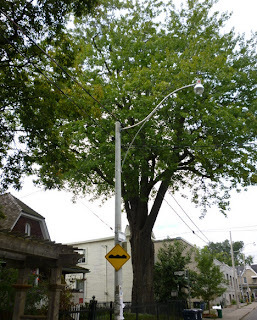 The loss of this Silver Maple tree got me thinking about the relatively recent loss of other iconic trees. 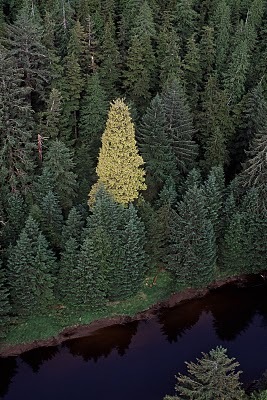 The most striking of these was the Golden Spruce on Haida Gwaii, sacred to the Haida Nation. It was vandalized and cut down. Other iconic trees lost in recent years was the last first generation tree of the original Macintosh apple. It was discovered growing as a wild apple in Eastern Ontario. It was better than other apples so the Macintosh grew it reproduced it and cloned it. It came to be the most popular eating and baking apple in Eastern North America. Several varieties were developed from it including my favourite when I lived in Connecticut, the Macoun. The last first generation tree was on the farm next to the Macintosh farm which is still a family apple farm. Then there is the Kirkwood Giant White Pine tree that was in the Kirkwood Forest near Thessalon. It laid claim to the tallest tree in Ontario, nearly 50 meters high., A storm brought it down after growing there for over 355 years. There are iconic trees of all varieties in Ontario, by age and variety. They actually keep track of these things. There is even a Facebook site where you can post pictures of great trees. Some of these pictures remind me to the loss of Elm trees of my youth to Dutch Elm Disease. To day we are faced with the loss of Ash Trees due to the Ash Bore Beetle and most devastating is the eventual loss of Pine Trees across the continent to the Pine Beetle. There are also iconic stands of tree under threat. The largest stand of red pine are not far from where I live. They are around Jack Lake a lovely lake with petroglyph drawing on the rocks. The right to cut them was owned by a local saw mill when I Ministry of Natural Resource technician recognized their unique nature. He recognized this site be protected from logging. Unfortunately, they have allowed a mining exploration effort go on dangerously close to them. North of here is the largest old grown forest stand of White Pines in the Temagami region. The local aboriginal community see this as a sacred place. It is vulnerable to logging still.Time will tell. I learned long ago that there is a unique stand of Red Spruce within the boundary of Algonquin Park. I wish I had known this before I paddle right past it without knowing years ago. Sometimes one should get off the water and into the forest. Just where we thought we knew everything about forest in Ontario they discovered a rare forest along the Niagara Escarpment, (over which Niagara Falls, falls) which runs from Niagara Falls to Manitoulin Island in Lake Huron. Along part of the Escarpment in the midst of the most populated part of Ontario, they discovered the oldest trees in Ontario, possibly North America. They are scrub white cedar clinging to the escarpment. The oldest identified so far dates from 688 AD. This remarkable forest was right in front of our eyes and we only recently learned of it's rarity. This story can be found here. 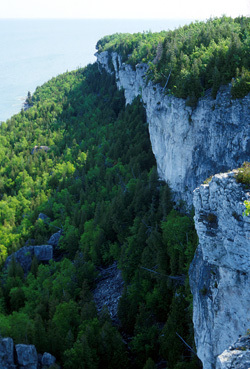 Park if the Niagara Escarpment. Change is coming to our forest due to climate change. We should love our trees and forests while we can. In particular we should continue to replant the urban forests of our cities. These are very important for many reasons from the aesthetic, to animal habitat, to using up carbon monoxide and giving off oxygen to keeping us cooler. We can never have too many trees in the city. There is much destruction of trees in storms and development that the planting and protection of trees is a major concern of cities that want to improve the habitability of itself. Do you have a favourite of iconic tree? A Citizenship Oath without the Queen? 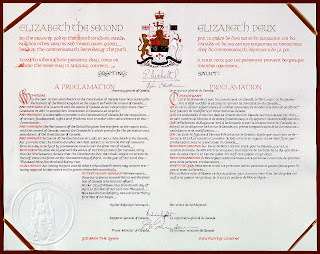 When I recently read that three permanent residents of Canada are challenging in court the reference to the Queen in the citizenship oath I felt myself getting really annoyed. If they find the idea of the Queen and thereby Canada being a Monarchy offensive, why would they even want to become citizens. After all they are free to remain permanent residence of Canada and enjoy all the benefits of citizens with the exceptions of holding a Canadian passport and voting. Instead they want to challenge the inclusion of the reference to the monarchy in the citizen oath as a kind of denial of the fact that the Queen is the head of State and a symbol of the Nation as a whole. The Monarchy is an integral part of our political system standing above our bicameral parliament and supreme court. 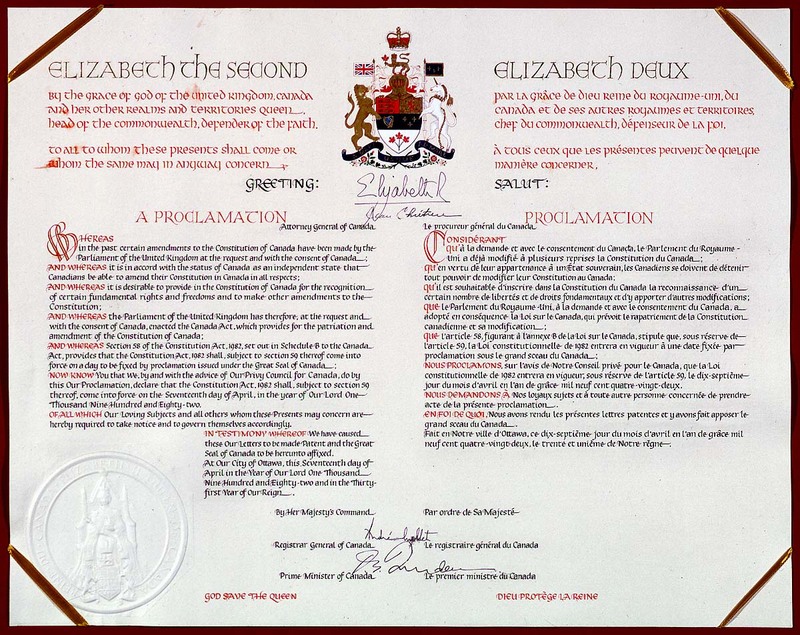 The above document shows how central the Queen is the Canada. She is the author of this page. This latest addition of our Constitution (the 1982 document is not the limit of our Constitution which include all other Constitutional documents and amendments back to 1867 British North America Act) in no way is an agreement to have a Monarch. The Monarch unquestioningly preexists. At the top she is referred to as Elizabeth the Second. We are referred to as her subjects and the document is "by her command". At the bottom is the respectful comment "God Save the Queen". For Canada, the get rid of the Monarchy, there is a special amending formulae. Most amendments to the Constitution must meet the 7/50 standard. At least seven province representing 50% of the population must approve. To change the Monarch, the use of two official languages or the Supreme Court there must be unanimous support of the Provinces. This demonstrates the importance of the Monarchy to Canada. The centrality of the Monarchy is the very reason that the Queen should be included in the Oath of Citizenship. I doubt if any court will uphold a challenge to this fact on the grounds that to include the Queen denies someones rights. The challengers can enjoy the benefits of living in Canada without becoming citizens. They are not stateless, for they are citizens of the country they came from. It they did not know that Canada was a Monarchy when then decided to come to Canada, shame on them for not doing their homework.. If they would prefer a Republican for of democratic government, their is the United States just south of our border. 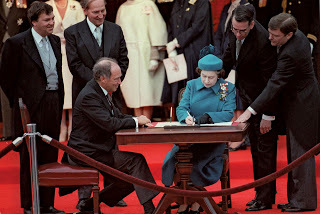 I like the fact that the Queen is the personification of Canada, the Nation,it is so much better that having corporate governance and laissez-faire politics as being the heart and soul of the Nation. How much richer it is to have our affection for the country focused in the person of the Monarch. I am not without sympathy for people having problems swearing an oath which included literal items the disagree with. My church denomination has a long history of refusing to affirm oaths. The Unitarian Universalist denomination has always refused to have a creedal test for membership. This resulted in being excluded from the National Council of Churches that required to affirm "that Jesus Christ is Lord and Saviour". To my knowledge we are still members of the Massachusetts Council of Churches, mainly because our denomination was a founding member. There was a time that the Lutherans tried to get us excluded. The Universalists, when they were a separate denomination in the 19th Century were prevented from giving evidence in a court of law because they believed in universal salvation and without a belief in the possibility of eternal damnation they could not be trusted for telling the truth if the swore an oath on the bible. Sometimes to take a moral stand on anything is to be willing to stand outside of the mainstream. Such should be the case of those who would like to become Canadians but who in good conscience cannot swear loyalty to the Monarch. My oldest friend's family came to Canada when he was a small child. They never became Canadian citizens. His oldest brother moved to the United States and had a career in the military there. His sister, moved back to Montana and married a rancher. Another brother, who served a period in jail for a felony was deported back to the US as a middle aged man. As a family, I think they were happy to be in Canada but they decided to not take out citizenship while enjoying the many benefits of living in Canada. My niece Laura just gave birth to a baby boy, her first, Benjamin Myssy. What a thrill for her and her husband Dominic. 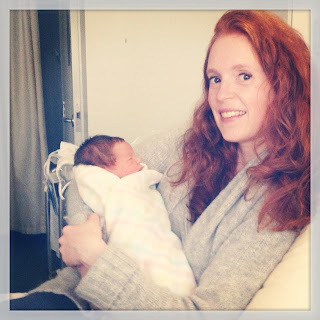 They live in Sydney Australia so young Ben is the first Aussie in the family. My brother is thrilled and seems ready to plan the rest of this young fellows life. As a sign of their special connection Laura had the baby on my brother's birthday. For many years they may celebrate it together. Laura is the oldest of my Brother and his wife, Carol's three girls. Lovely young women the are. Nice people who have accomplished much in their lives. Laura is qualified as a lawyer in North Carolina and now has qualified as a lawyer, or is it barrister, in Australia, where she and Dominic now live. The other two girls, Heather and Andrea and still in school working to earn doctorates. No indication yet when they might add some new family members. Laura and Dominic will be wonderful accomplished parents I am sure. Life has now taken on more meaning for them both. Congratulations! Perhaps, if Ben is lucky he will learn Arabic as well as English growing up. His paternal grandparents immigrated from Lebanon. At least some members of the family speak Arabic for he has an aunt who is an Arabic broadcaster. How rich his life will be with this wonderful second language. Laura isn't the only one to deliver offspring. Mother Cat gave birth to a littler of five, four of them are orange cats. My other three cats from a previous litter also have orange in their coats. I am not sure where this colour is coming from, Life is full of surprises. This week I have been following the news about the massive wild fire in Arizona and the loss of life of the 19 fire fighters. It has spoiled the Canada Day celebrations for me. Instead I have followed this story and tried to understand it all the while feeling very weepy about it. Such a dreadful loss for so many families from one community. It is an absolute horror for the brotherhood of fire fighters who do this dangerous work. I think also of those in charge whose planning went so wrong that a crew ended up perishing. And still, the fire rages on. 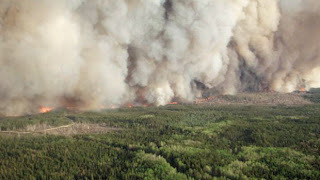 Here is Northern Ontario we live with the threat of forest fires every year. Some years it is worse than others depending on the weather. We have become very skilled at fighting fire small ones and large ones. Some if they are remote enough are allowed to just burn, for fire is a natural part of the life cycle and renewal of forests. Last year we had a very large fire just north of where I live. It is known as the Timmins Fire 9. 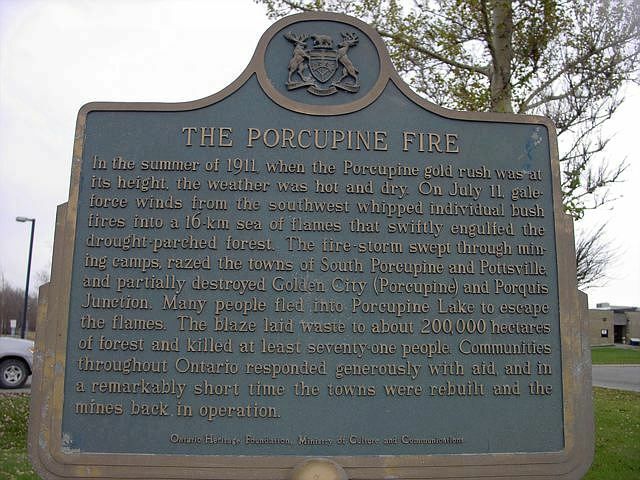 It burned over and area of 40,000 hectares, southwest of the city of Timmins, such that it presented a threat to that city. It began in mid May and was not officially declared out until November when first snows fell. It was not raging flames over that period of time, most of the hard and dirty work for forest fire suppression crews are going over the burned over areas and making sure fire fire does not spring up again from the smoldering soil, which burns, and downed trees continuing to burn from the inside out. Our record of fighting fires is very good. 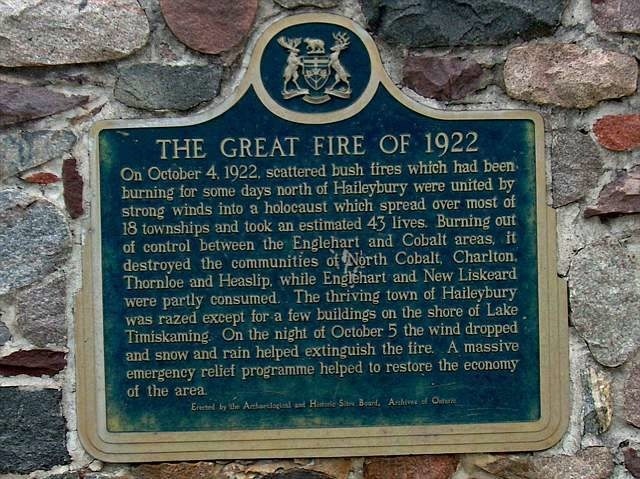 Last year, the Timmins 9 fire was just one of 600 fires fought that year, an average fire season. We have learned over the years how do it, when and how to fight the fire. There is the use of aircraft dropping water on the fire and some chemicals to suppress the fire. There is heavy equipment on the ground to clear fire brakes of help gain access to the fire. And, or course, there are men and women on the ground with saws, shovel, water back packs and the running for hose trying to protect peoples camps and homes where possible. It is one of the toughest of jobs in the heat and dirt and long hours. In thirty of forty years there has not been a single death of a forest firefighter in Ontario, a vast area much larger than any US State. What went wrong in Arizona that they had this tragedy compared to Ontario record. I don't know all the answers but some things suggest themselves. 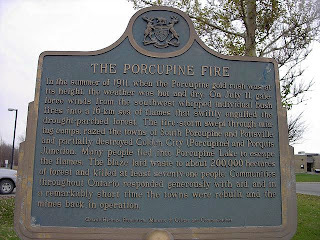 Ontario has fires in and around a multitude of lakes and rivers. There is lots of water to fight fires Water bombing is widely used. 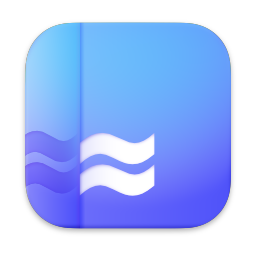 Escape in an emergency can be into the water..The water bodies can be used as natural firebreaks. While our land is rough it is not mountainous. Our summer temperatures are not as hot as Arizona and our climate is not as dry. We do not note call our forest fire fighters, "hot shots". They are called forest fire technicians. Is this a difference in attitude. Fighting a fire is not a heroic challenge. It is a containment exercise beginning around the edges gaining advantage when nature allows. To my knowledge, fires here are not fought up close in a frontal assault. The safety of the workers is paramount, forest will regrow and human structures can be rebuilt. I trust lessons are learned from the tragedy of the death of Arizona's forest firemen. Part if the 64 mile front of part of Timmins 9 fire. It was 10 miles wide as some points. 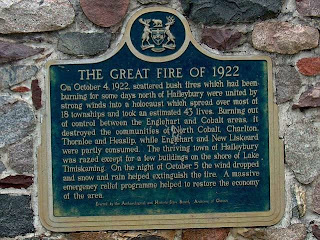 there were terrible fires: the Porcupine Fire, 1911, the Matheson fire, 1916, and the Great Fire around Hailybury, 1922. were the worst. 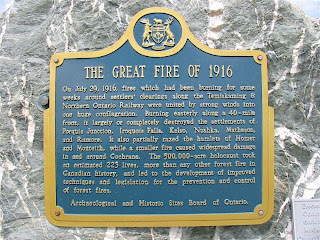 As a result of the Matheson Fire the decision was made by the government to develop the capacity for fight fires. In these early fires, local people were on their own. The stories of how some of them died is tragic. One group thought if the crouched down in railroad rock cut the fire would safe pass over them. It did but it also used up all the oxygen on the ground. This story came to mind when I read about the Arizona firefighters on the ground under their fire blankets. 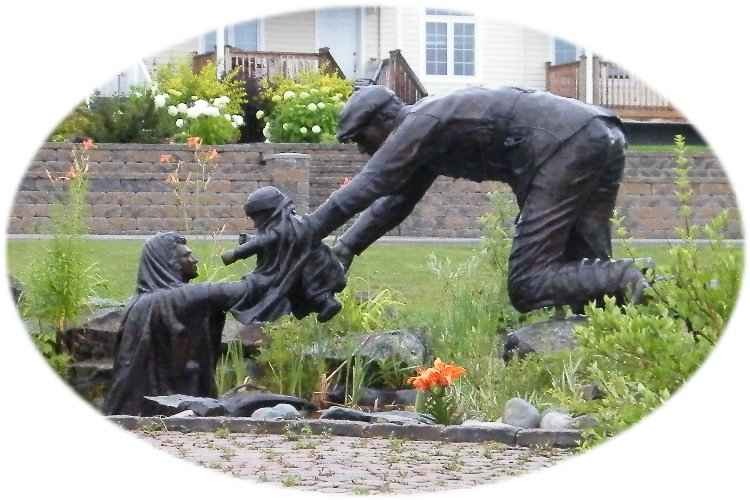 In an area of many lakes and rivers many survived by going into the water Below is a monument in Hailybury depicting doing this. The sculpture is by Ernie Fauvelle. Living in the Northern forest, we must always be vigilant to against forest fire. Most are started by lightening strikes and those caused by human activity must be kept to a minimum.